STARVING for a PUMP, that is! Just kidding. Right now I’m actually starving for food. I want real food in and around my mouth as quickly as possible. Because I just talked on the phone for like three hours and as you know, I’m so much better and comfortable at typing to my computer or phone than speaking out loud. Speaking burns calories. And I spent SO many calories this morning doing my one and only arm day of the past month. My arms grow like the hulk when I hit them exclusively, so literally like once every two weeks is all I want or need. Today I took NSC Pump Catalyst before the workout to see if it worked. Let me tell you how it went. There are two flavors of Natural Science Creation Pump Infusion Hyperemia Catalyst: The cotton candy, and a peach mango. I will tell you how the orange mango tastes first, and then the cotton candy. Peach Mango: I would give this flavor about a 6/10 on flavor. Maybe a 7. I tried some of Alex’s at the gym (she’s the one who convinced me to buy the cotton candy, and is the biggest Sarah Bowmar fan of all time), but I was pretty hesitant after trying the peach mango. You guys know I really am not a fan of artificial peach flavored supplements, so to even get myself to chock it down was tough. But it is so peachy. So artificial-tasting, and has some sort of ingredient that makes your breath all weird after. I really was not a fan. Cotton Candy: The Cotton Candy flavor is the best flavor of Natural Science Creation Pump Infusion Hyperemia Catalyst. I found the sweetness to be really strong, but not overdone. I don’t know how they managed to get actual cotton candy flavor into this product but they REALLY did seem to capture some authentic cotton candy flavors. I think the only other cotton candy flavored supplement was the Mr. Hyde pre workout from ProSupps. And this Natural Science Creation product definitely exceeds that one in terms of just being a better product. I give the cotton candy Hyperemia catalyst an 8/10 on flavor. So now on to the question that REALLY matters- does Natural Science Creation Pump Infusion Hyperemia Catalyst work? 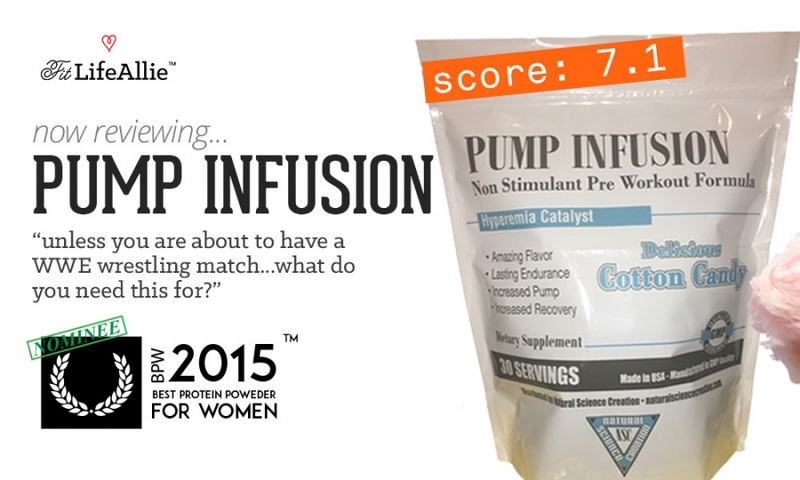 NSC Pump Infusion definitely gives you a PUMP. So. You guys know I tried the Natural Science Creation CUTS product and was not a fan at all. Nor was I particularly fond of their TRT / hormone product. In fact both products sort of rubbed me the wrong way, both from a formulation and branding standpoint. Both were way overpriced, and just not good enough to justify such markup. The PUMP Infusion is also priced INCREDIBLY high. And honestly, for what it does, I just don’t know if it’s worth it. Basically this product is a big huge scoop of carbs, citrulline, and agmatine sulfate. If the pump is your thing, than I think this Natural Science Creation product will make you happy. After just two sets of curls I could feel the blood rushing in uninhibited into the muscles, filling them and stretching my skin to levels I don’t know that I’ve ever really experienced before. It was almost painful. Like. I didn’t even get to my fourth set of curls because it was just uncomfortable. I gave a scoop to my boyfriend before he left today and he texted me the 'vein-iest' snapchat I’ve seen since, well, you get it. Lol. Last night. So. Hm. I guess I don’t know what to tell you about this stuff. Is the pump that valuable for helping you reach a goal of completing a tough workout? Not really. Like. I could barely finish mine. Basically if you are doing any sort of workout OTHER than a bodybuilding photoshoot workout, or getting ready for a match in WWE, than I seriously am not sure what the point of a ‘pump exclusive’ product like this is… it’s just overkill. Natural Science Creation Pump Infusion Hyperemia Catalyst Formula Is PUMP-Y. Of course. Like. What else did you expect. The main ingredient is something called “Carb10”, which is some sort of mystery carb derived from peas. Apparently this stuff is absorbed quickly, but doesn’t raise insulin. The use this to give prolonged energy and of course fill up the muscles. The next ingredient is your standard citrulline malate, known to increase blood arginine levels and create that pump. It also doubles as an endurance ingredient. The final ingredient is branded agmatine sulfate- another, wouldn’t you know it, PUMP ingredient. Improving blood flow, and giving headaches. That’s what this ingredient does. I actually hate it because it gives me a pretty legitimate headache like 10 minutes after I take it. So. Just keep that in mind as the only side effect of Natural Science Creation Pump Infusion Hyperemia Catalyst. Other than not being able to finish your workout, that is. And so formula-wise, I would have to give it the equivalent grade of what I give the performance, because the formulation maps exactly back to how it works. It’s just too pump-y, at the expense of having a good effective workout. I’m really not a fan. Natural Science Creation Pump Infusion Hyperemia Catalyst Looks Awful. I’m not going to spend too much time ragging on NSC packaging, because as you know from my CUTS and TRT reviews, I hate everything about the way Natural Science Creation looks. They try to make it look like a pharmaceutical, but it ends up just looking really, really bad. The stand up pouch is a nightmare too. You get powder all over your hand and all up out of the bag onto your counter. It’s obnoxious.